Growing signs of a return to territorialism, new emerging technology risks, ongoing operational risks and a rising focus on environmental risks are all making the financial services agenda increasingly fluid, complex and uncertain. Combined with evidence of slowing economic growth and low interest rates in the US, Europe and China, the pressure on financial services organizations is growing. This edition of Frontiers in Finance is about facing the challenges head on and triumphing over them. Instead of staring numbly at the risks, the articles compiled for this edition aim to help readers better manage their risks; more effectively respond to changing regulation; and uncover opportunities for competitive advantage. It is about capitalizing on the regulatory and risk landscape. The articles explore a wide range of risks facing banks, insurers and asset managers around the world. Some, such as our articles on managing AI risks and RegTech, take a look into the future to help decision-makers plan their longer-term business and operating strategies. Others, such as our articles on weather-related risks, the adoption of IFRS 17 and the shift to alternative reference rates were written to help readers overcome much more clear and present challenges. Throughout this edition, our authors and subject matter experts offer forward- looking and practical advice to help nancial services rms turn some of today’s social priorities into longer term competitive advantage. We look at how environmental, social and governance considerations are in uencing investments by asset managers. We explore tax in the digital financial services world. And we shine a spotlight on efforts to stamp out human rights risks in the sector. In today’s environment, decision-makers can either fret about the risks and challenges they face or they can take steps to capitalize on them. We hope that this edition of Frontiers in Finance catalyzes the pessimists into action and offers the optimists new ideas to help turn risk into opportunity. On behalf of KPMG’s Global Financial Services network, we would like to thank all of those industry leaders, observers and subject matter experts that participated in the development of these articles. 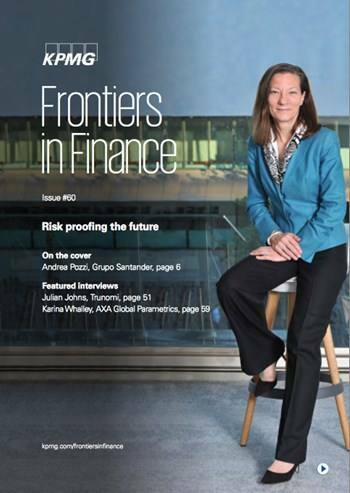 To learn more about any of the themes raised in this edition of Frontiers in Finance, or to discuss your company’s own unique risks and challenges, we encourage you to contact your local KPMG of ce or any of the authors listed at the back of this publication.